Reason for inclusion: This has appeared on countless “best of” lists, and I am always looking to see more of Cary Grant’s work. 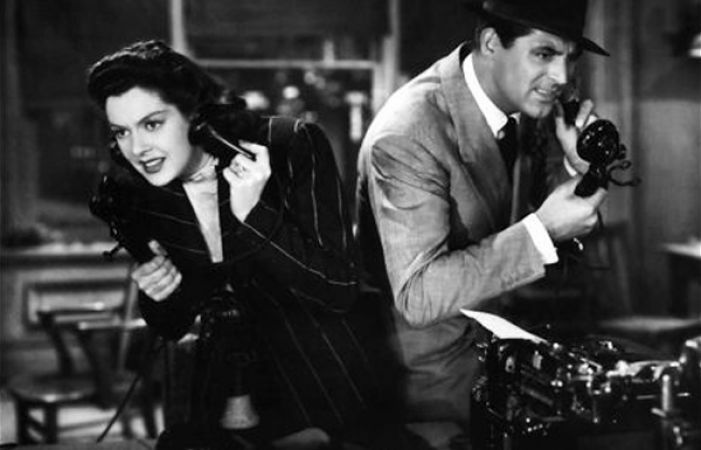 A lot of classic films have rapid-fire dialogue, but His Girl Friday may just take the cake. I would love to see the size of this script, which seems to pack three hours of dialogue into just 90 minutes. Rosalind Russell stars as Hildy Johnson, a former news reporter who is eager to leave that fast-paced lifestyle, going so far as to get engaged to a rather plain insurance salesman, Bruce Baldwin (Ralph Bellamy). On the eve of her trip to Albany to make the marriage official, Hildy drops by the newspaper to tell her ex-husband (and editor of The Morning Post), Walter Burns (Cary Grant), about her plans. One problem: Walter is still in love with her and will do anything possible to win her back. Played to manipulative perfection by Grant, Walter quickly gets to work at devising plans to keep Hildy from going to Albany. His methods are cruel but effective — he manages to get Bruce arrested no less than three times (including once by planting counterfeit money on him). This gives Walter more time to make his move. As a screwball comedy, the series of events grows wilder and wilder, and Hildy finds it increasingly difficult to get away and leave for Albany on time. It becomes apparent that Walter and Hildy are cut from the same cloth — both are “newspapermen” that get such a rush from breaking a big story, yet struggle to separate their personal and work lives. In most cases, it would be hard to sympathize with either of these characters, but c’mon, it’s Cary Grant and Rosalind Russell! These two play off each other beautifully, and their chemistry is undeniable. Even though both play such dastardly characters, they are so much fun to watch. The aforementioned rapid-fire dialogue is a real highlight of the film as well, even though it’s sometimes hard to keep up with the constant overlapping chatter. This is a film that benefits considerably from subtitles, and I was almost afraid to laugh just so I didn’t miss another great line. Regardless, the script (and its cynical look at the newspaper business) is relentlessly engaging, still providing fruitful exchanges so many years later. 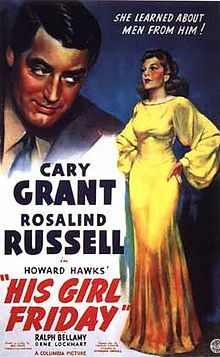 My favorite Howard Hawks film. Every time I rewatch it I find something new. It still delivers. Fine look at this, Eric. Thanks, Michael. It’s amazing that with so much dialogue, there is nary a wasted line. Really enjoyed this one. This looks positively delightful!! I need to see a Howard Hawks movie one of these days, yes same w/ Billy Wilder! Great look on this Eric. This one is a lot of fun, Ruth. I think you would enjoy it! 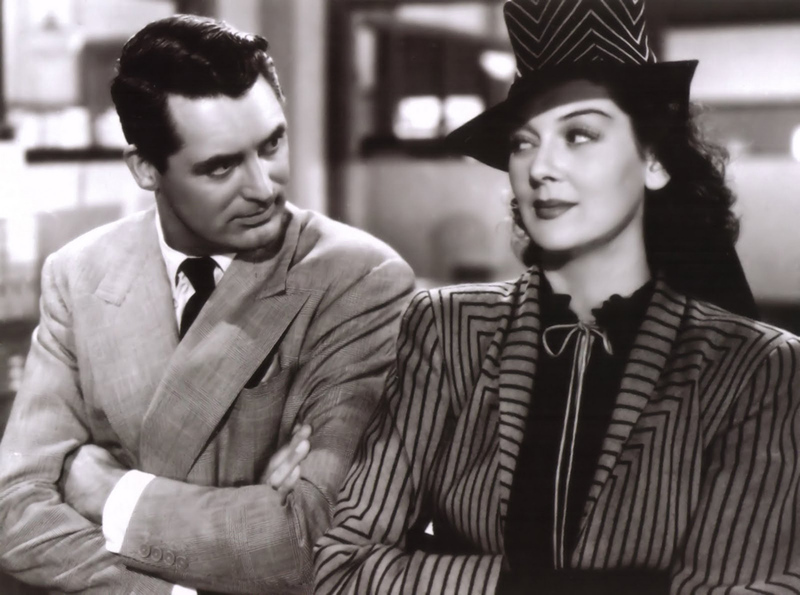 ‘His Girl Friday’ moves just slightly less quickly than ‘Bringing Up Baby’. But the back and forth and often layered repartee runs twice ans fast and is even more melodic. An excellent choice and critique! Thanks, Jack! Now you’ve got me curious about Bringing Up Baby. 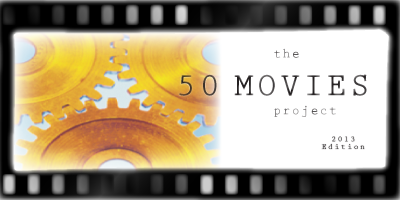 I can’t imagine a film being even faster than this one… wow. The acting is impressive considering the rapid-fire dialogue, but I have to admit my brain couldn’t keep up, so I had to pause every 10 minutes to catch my breath. I think I might have liked it more, if I’d watched with subtitles-might give it a second chance one day. Glad you enjoyed the film, anyway! Yeah, I know exactly what you mean. Without subtitles, I’m not sure I would have been able to keep up nearly half as well. Really enjoyable film overall though. I’ve heard a lot of high praise for this film, but haven’t had the chance to check it out yet myself. Glad to hear it’s pretty good. From the sounds of it, I’m gathering this is a fairly witty film as well? Oh yeah, it’s definitely a witty little film. Lots of great lines, most of which buzz by at breakneck speed. Subtitles were incredibly beneficial just to catch some of the more clever bits. Thanks man. This one is streaming on Netflix if you’re curious to check it out. A blind spot for me too. Cary Grant is someone I need to see more films of, especially if he’s playing a character like this, as he seems to excel playing devious, conniving men. This film has been on my must-see list as well, it’s time I give it a shot! Grant is so much fun in this role. This film is still on Netflix Instant if you’re curious — definitely worth a look! Love this film and have watched it a bunch of times. Russell and Grant are so great, and the rapid-fire dialogue works so well. Glad you enjoyed it! Hey, thanks Dan. It’s a fun film for sure. I was a little worried that it wouldn’t live up to the hype, but I really dug it.